Manchester United goalkeeper David De Gea remains "calm and relaxed" despite a "manic few days", his club and Spain international team-mate Juan Mata says. The 24-year-old has not played for United this season because of interest from Real Madrid, culminating in a failed deadline-day deal to sign him. 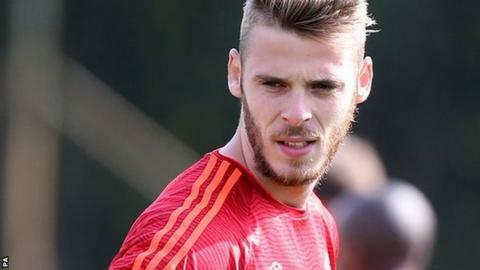 But Mata said De Gea, who was in the club's Champions League squad submitted to Uefa on Tuesday, is ready to play. "His hunger and professionalism are intact," said Mata, 27. "He seems the same as ever to me, calm and relaxed," added Mata, who is on international duty with De Gea for Spain's Euro 2016 qualifier against Slovakia on Saturday. "It's been a manic few days for him, he's my friend and I'm there for him for whatever he needs. Right now he's focused on the two upcoming games for the national team; being here will do him good and he's going to be as professional as he has been throughout his career. "His personality will help him. He manages to play even better in moments of maximum pressure and stress. His personality will help him on and off the pitch. "We all know what a great goalkeeper he is and he would make any team in the world better. The fans will get behind him and so will the team." Transfer spending at record high Where has the last 48 hours left Man Utd? United winger Ashley Young told BBC Sport everyone would be "pulling in the right direction" when they returned after the international break. And on De Gea, player of the year at Old Trafford for the past two seasons, he added: "He is a professional player, always has been, always will be." De Gea is one of three keepers picked for United's European campaign by boss Louis van Gaal. Argentina international Sergio Romero - who has been starting United's recent games in place of De Gea - and youngster Sam Johnstone are also included. However, former Barcelona man Victor Valdes is not included as he continues to be frozen out by Van Gaal after the Dutchman claimed the keeper refused to play in a reserve game. Earlier, Spain boss Vicente del Bosque said De Gea's Euro 2016 finals spot would be at risk if he does not feature for his club side this season. He told Spanish radio: "If he doesn't play it will be very difficult for him to come." De Gea has made five appearances for Spain and Porto's Iker Casillas - who has 162 caps and left Real Madrid in the summer - remains first choice. He has linked up with the squad for Euro 2016 qualifiers against Slovakia and Macedonia, while United and Real argue over responsibility for the failed transfer. "He needs to be professional and move on from this episode. I hope that he starts playing again and is happy, and if he plays well we can bring him along," Del Bosque added.